A meeting place that exudes flair and charm. Right next to the vine-bordered amphitheatre, woods and vineyards nestle against the twin town to the left and the right of the Moselle. A wealth of fascinating buildings with architectural treasures from art nouveau and the Belle Epoque turn your holiday on the Moselle into a romantic experience. "There is something to do for everybody"
Traben-Trarbach, the jewel of the Central Moselle. Once upon a time Traben-Trarbach was a busy wine trading place, and the town became wealthy around the turn of the last century. The large wine cellars and magnificent big art nouveau villas bear witness to this. Visitors can now take part in guided tours of these cellars or stay the night in one of the art nouveau houses. The good wine is still available today. 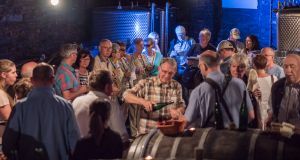 You can see for yourself if you go for a wine tasting at a winemaker's or visit a good restaurants or one of the many events in and around Traben-Trarbach. 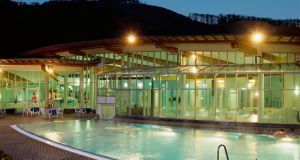 You can find some of our exquisite highlights out of the region of Traben-Trarbach. See whether you can see your own highlight. 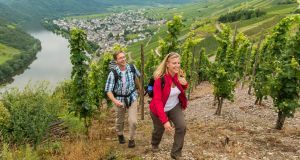 Including 365km the Moselsteig is not only one of the longest but also one of the most exciting quality long-distance trail: exciting varieties, challenging lengths and suprising in its own way. Since Traben-Trarbach was the second-biggest wine-trading place in Europe in the second half of the 19th century the capacity of wine-cellars had to be enlarged like in no other place on the Moselle. So new cellars were built in large areas in the underground of the town. Discover our town in a guided town below or above the suface! Classy wines grow in our slate vineyarrds around Traben-Trarbach. Indulge yourself to an informative and fun wine tasting in a local winery and discover your favourite wine. Delve into a 200 square meter world of water and steam. And a sauna landscape, which will fill you with enthusiasm. You will emerge as if new-born.